"Easy recipe to put together for that laid-back 'Maui Wowie' person. Great for the beach or backyard BBQ. You will be surprised by the onolicious flavor. This dish always gets the Shaka sign!" Preheat outdoor grill for medium heat, and lightly oil the grate. Thread shrimp onto skewers. Season both sides of shrimp with garlic salt and black pepper; if using cayenne, see Cook's Note. Generously coat both sides of shrimp with mayonnaise. Cook shrimp on heated grill until shrimp are bright pink on the outside and opaque on the inside, and the mayonnaise turns golden brown, 5 to 10 minutes on each side. Serve with lemon wedges. 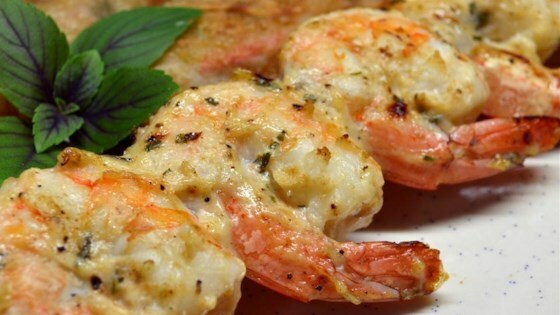 The tangy marinade makes the shrimp moist and flavorful. Cayenne pepper can be added with the garlic salt and black pepper, or mix 1/4 teaspoon into mayonnaise before coating shrimp, for a spicier flavor. We loved this recipe. Made a few changes, by adding Cajun seasoning to the mayo. We cooked under the broiler, 2 minutes on one side then 3 on the other. quick and really easy this is defiantly will make again. Added some minced garlic, 1/4 teaspoon garlic powder, 1/4 teaspoon onion powder, 1/2 teaspoon parsley and 1/3 teaspoon cilantro. My picky hubby said it could be a recipe in a restaurant.